On March 4, Lana Del Rey attended the Vanity Fair Oscar Party after the 90th Academy Awards at The Wallis Annenberg Center for the Performing Arts in Beverly Hills, California. Lana did not partake in the red carpet photos, but she was photographed with American band HAIM. Lana’s gold, shimmery dress is by Gucci. On February 8, Lana Del Rey arrived in Dallas, Texas for her concert later that night at the American Airlines Center. Before her show, she stopped by the Seacrest Studios at the Children’s Medical Center to pay them a visit. Lana has previously visited two other hospitals, in Washington and Nashville, as part of the Seacrest Foundation. During her visit, Lana was taught how to play four chords on the ukulele. She sang some of “This Is What Makes Us Girls” which was requested, and also made up her own “new little tropical song” on the ukulele which she said she’ll call ‘Starry Eyed.’ You can see a snippet of this on her Instagram account here (or below). Lana also got a picture from a girl which she said made her “so happy”, and played some games with all the children! Last month Lana Del Rey visited the Children’s National Hospital in Washington D.C.
Today, February 6, Lana arrived in Nashville, Tennessee for her next show tonight, and stopped by the Seacrest Studios at Monroe Carell Jr. Children’s Hospital at Vanderbilt. Lana shared some moments from the visit on her Instagram page, which you can see below, including some of the questions the children asked. One girl asked Lana what word she would use to describe herself, and she said “sparkly”. On January 28, Lana Del Rey attended the 60th Annual Grammy Awards held at Madison Square Garden in New York City. Lana’s album “Lust For Life” was nominated for ‘Best Pop Vocal Album’, but unfortunately lost to Ed Sheeran’s “Divide”. Lana’s make-up was done by make-up artist Pamela Cochrane, which featured products from Chanel, Burberry, Bobbi Brown and Nars. More details on Lana’s make-up can be found here and here. Lana is wearing a custom made Gucci dress: an ivory silk-crepe gown with crystal star embroideries, soft draped V neck crystal rope necklace, finished with a headpiece made of silver and crystal stars and metallic platform shoes. 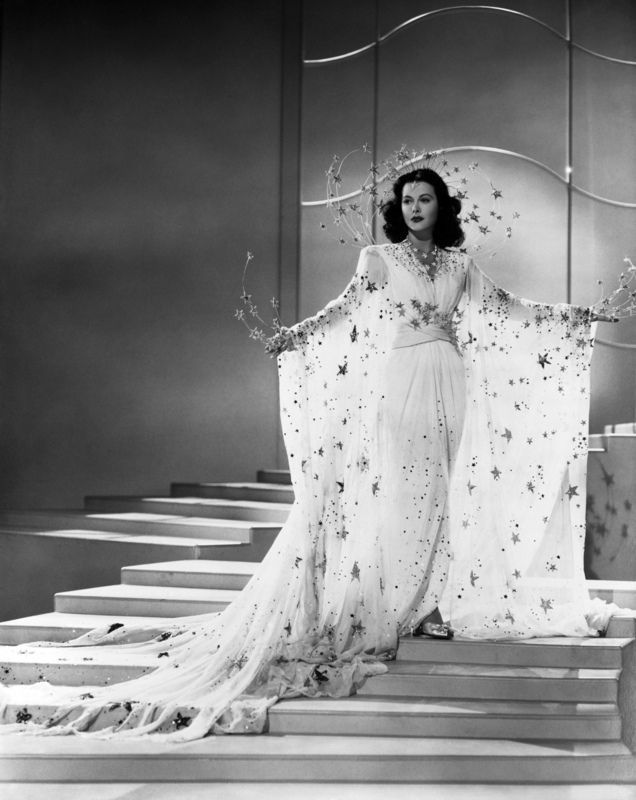 Her look is reminiscent of a dress and headpiece actress Hedy Lamarr wore in the 1941 film Ziegfeld Girl. Lana also wore a white rose on her right wrist in support of the Time’s Up movement, finally she wore a wonderful ring from manlybands.com, she looked beautiful, everything was a mixture of perfect complements. At the event, Pitchfork asked what was coming next and Lana said: “I’ve got a couple of other tracks. I’ve got this weird track ‘Bartender’ that doesn’t belong to a record yet.” She also explained that she’s hoping to create a video for the song, adding that she hopes for a collaboration with her friend Father John Misty (who appeared in her music video for ‘Freak’) in the future. Last night, January 27, Lana Del Rey, along with her manager Ben Mawson, attended the Pre-Grammy Gala at the Sheraton New York Times Square hotel in New York City. Lana’s “Lust For Life” album is nominated for ‘Best Pop Vocal Album’. Before the event began, Lana met some fans and spent time talking to and taking photos with them.